Thaddeus (sixth left, third row) with KBK members and winners during a photo call. 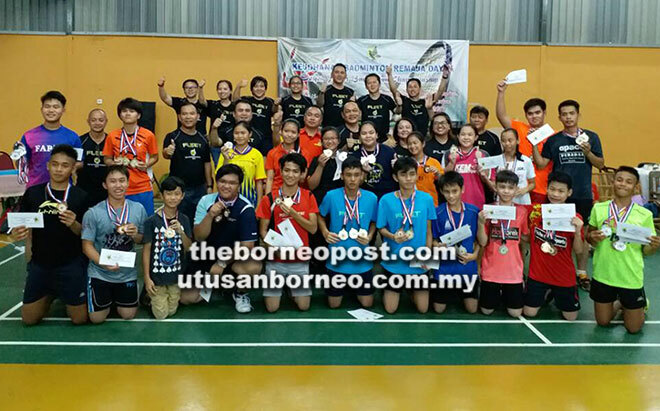 KUCHING: Kelab Badminton Kenyalang (KBK) will organise next year’s Dayak Junior badminton tournament in Bintulu due to popular demand and special requests from those in the central and northern region. Its president Petrus Ngalih Tinggi said the 2018 edition, tentatively in October, will be one of KBK’s annual programmes. A coaching course for both parents and teachers and relevant courses for badminton coaches and umpires are in the pipeline while KBK also aims to collaborate with NGOs especially Sarawak Dayak National Union (SDNU) towards the development of badminton and Dayak youth. He said this at the closing ceremony of the KBK Dayak Junior Championship 2017 badminton tournament held at the Champion Hall on Saturday. Guest-of-honour Thaddeus Ling Allu who is special officer to Minister for Public Utilities Dato Sri Dr Stephen Rundi Utom represented the latter to give away all the prizes. Also present were Sarawak Dayak National Union Youth (SDNU) chairman Churchill Edward Drem, who is also KBK advisor, and its deputy president Diana Empeni Lang and secretary Anthony Ugor Nili, who is also chief umpire. The Boy’s Under-18 doubles champion were Gilbert Viieery Jinggan and Davis Paul who beat Nalthan Lissem Nicholas and Aidan Nanggin Lenjoe. The Boy’s U-16 title went to Jeffswell Jidat Roland-Bryan Dexter Francis after defeated Emerson Gima Entail-Freddie Lambert Rorton. Freddie also claimed the U-12 singles title after beating Bernard Russel Bayan while Jeffswell defeated Leo Pavel to become U-14 champion. Jeffswell also took the U-16 honours. Gilbert Vieery was Boy’s U-18 singles champion after overcoming Nalthan. Peggie Jameswell beat Claudia Vyronnitica to become Girl’s U-14 champion while Lloyderyena Xalfia Simon won the U-16 category after beating Rahel Anthony. In the Girl’s U-16 doubles, the pair of Lloderyena-Rahel beat Tynisia Medan-Rachel Uding Sem to claim the trophy.